We’re So Glad about the Glade! Good morning, folks! Olive here with a special report featuring all the camp’s latest. We’ve had lots of arrivals in the past few days and camp is starting to get full and buzz with energy. We’re getting ready to welcome a big batch of returners this weekend and we can’t wait to get started with returner training and then our speciality area trainings (lifeguards, horses, and ropes) next week. This weekend staff are celebrating the end of pre-camp at longtime HVC staff members Gi and Eric’s home, where we’ll enjoy barbeque and bananas flambe. 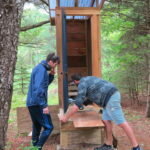 In the meantime, staff are getting focused on their various areas and prepping camp for the summer. 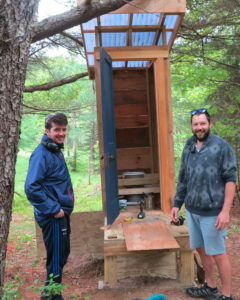 Carmi and Kev are down at “The Glade” (our new on-site camping spot at the end of Deer Meadows field) constructing our new compost toilet, one of the new amenities of the area that will make it perfect for camping or your quiet afternoon poo. 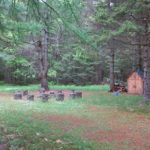 We can’t wait till the Glade is all ready and we can start having cabin nights, stargazing, and camping trips at our favorite new spot. 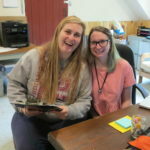 Our wonderful art Poobahs (magical area heads of the Buckhorn, Darkroom, and Animal House), Max and Elise, have connected and dived right into their work for the summer– ordering lots of glitter glue and getting the studios all ready. Our Community counselors have been busy getting Blodgett house ready and doing research and planning for their trips and community service. 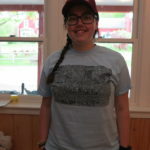 And be sure to check out the design for our new camp shirt this summer, made (and modeled) by Rachel M., which is a to-scale map of HVC done entirely in text (see what you can find if you look closely!). I’ll be sure to keep y’all posted as camp fills in and we get started on lots more staff training and camp prep. Let the good times roll! Elise and Max, our amazing art Poobahs! 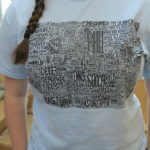 Rachel modeling her amzing shirt!